Application: Point it directly at a face and shoot through the ring for a soft, even light creating a glamorous look. LED Ring Light Hire from Cam-A-Lot Rentals. A ring light is used to create very soft even lighting when shooting faces close up. The size and shape of the light minimises shadows. This gives a very glamorous and forgiving image where wrinkles and shadows are minimised, and eyes are accentuated. You position the light directly in front of the face and shoot through the middle of the opening. The ring light has a built in diffuser to further ensure it is more flattering towards the subject matter. This type of setup is very popular for makeup artists as it helps you to apply makeup more easily and accurately. It is also popular with YouTube content creators and bloggers or vloggers. It ensures there is enough light on the face and that it looks great. The light offers high levels of control as it is dimmable, and colour temperature adjustable. This can be done with the remote control. This can help the lights to match with other lights in the room and make the picture more natural. The light comes with a power supply but there is a battery option if you want to add it. This ring light has a High Colour Rendering Index as it uses ultra-high CRI LED lamps. These have a rendering index of higher that 95%. This means that the colour is highly-accurate & faithful which is important for accurate skin tone and makeup application. 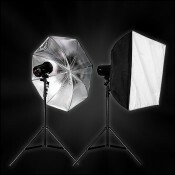 If you looking for off any other photographic lighting visit our Photography Lighting Page. You can visit and like our Facebook page here.